Background: Collagen Corneal Cross-Linking (CXL) is a surgical technique that combines ultraviolet light and riboflavin eye drops as a one of the modern therapies for keratoconus. Objectives: This retrospective study aimed to assess the visual outcome, corneal curvature, corneal thickness, and refractive status after CXL. Methods: The records of 25 patients did CXL during May 2012 to May 2014 at Makkah Eye Hospital were reviewed. The recorded data included uncorrected and best-corrected visual acuity (Nidek Chart Projector CP 670 Japan), central corneal thickness and average K-readings (ATLAS 9000, Corneal Topography System, Germany), and refraction (Nidek Auto Refractometer, AR310A Japan); all these measurements were taken at baseline before CXL and after 1 year post-CXL. Results: The age range of this group was 12–26 years of whom 60% females and 40% males. A little improvement of vision was achieved from a presenting mean 6/30 to CXL mean 6/20 at P = 0.024. No significant difference was observed in corneal central thickness preoperative mean 447.72 ± 27.52 μm) and postoperative (mean 448.83 ± 22.35 μm). K-readings showed only limited changes in the form of astigmatism and not in the degree of astigmatic error (mean 2.80 ± 1.327 D) preoperative and (mean 3.08 ± 1.717 D) postoperative. A moderate spherical refractive error (noncorneal) was persisting (mean 2.79 ± 2.09 D preoperative and 2.66 ± 2.10 D postoperative). Conclusions: CXL assumes controlling of corneal ectasia and regarded as one of effective procedures in improving the vision, particularly when combined with optical correction. The adult average cornea is 500 μm thick; however, in some cases, the cornea becomes thinner which leads to visual distortions and keratoconus. This degenerative noninflammatory disorder of the eye often onsets during the teenage years or early twenties with decreased vision, and light sensitivity also may be noticed. Keratoconus can be difficult to detect in the early stage because it usually develops slowly; however, in some cases, it may proceed rapidly; as the cornea becomes more irregular in shape, it causes progressive myopia and irregular astigmatism. Keratoconus shows an autosomal dominant mode of inheritance, a positive family history; it has been found in all races and in both sexes but found to affect females more often than males. Keratoconus affects between 50 and 230/100,000. A racial factor as well as climatic conditions may play a role. A relatively high incidence has been documented in the Mediterranean and a Middle Eastern area; a relatively lower incidence has been reported in places such as Japan, Taiwan, and Singapore. Males may be at higher risk than females; in addition, the prevalence of the condition is about 7% in Down's syndrome. This retrospective study involved 25 keratoconic patient's data collected from cornea clinic in Makkah Eye Hospital during May 2012 to May 2014. The data included age, gender, visual acuity for distance with and without correction (Nidek Auto Chart Projector Model CP 670 Japan), auto-refraction (Nidek Auto Refractometer, AR310A Japan), and central corneal thickness and K-reading ( Atlas More Details 9000, Corneal Topography System, Germany); the process of analysis is dependent on the patient's present examination data before the CXL operation compared to the data after 1 year post-CXL operation to evaluated the outcome. In [Table 1],[Table 2],[Table 3]: The age range of this group was 12–26 years of whom 60% females and 40% males. A little improvement of vision was achieved from a presenting mean 6/30 to CXL mean 6/20 at P = 0.024. No significant difference was observed in corneal central thickness preoperative mean 447.72 ± 27.52 μm) and postoperative (mean 448.83 ± 22.35 μm). K-readings showed only limited changes in the form of astigmatism and not in the degree of astigmatic error (mean 2.80 ± 1.327 D) preoperative and (mean 3.08 ± 1.717 D) postoperative. A moderate spherical refractive error (noncorneal) was persisting (mean 2.79 ± 2.09 D preoperative and 2.66 ± 2.10 D postoperative). This study shows a preliminary assessment of collagen CXL as treatment of keratoconus in a Sudanese sample. The sample size in this study was 25 subjects which is relatively small. However, this is due to the small number of patients who did the operation during 2 years of time. Although a relatively high incidence has been documented in the Mediterranean and Middle Eastern areas. Therefore, the results should be interpreted with caution and this sample was likely to be accepted as representative for the initial assessment in our community. The age range of the sample was 12–26 years, with a mean 17.20 ± 4.17 standard deviation; this is the age of adolescence, and major changes and development in eye structure were expected during this period. There were more females (60%) than males (40%) among the group. According to the study of Koppen, males may be at higher risk of keratoconus than females. However, when looking at personality traits, the keratoconic females have shown increased rates of depression. However, the more female's preponderance in this group is unlikely to cause an effect in results of this study. Visual acuity is the conventional and standard test most commonly used test to assess visual function. The Snellen-based charts are universally accepted tools for testing visual acuity despite its poor reliability and reproducibility. Visual acuity in this study is the only tool used to evaluate the effect of CXL on presenting vision. 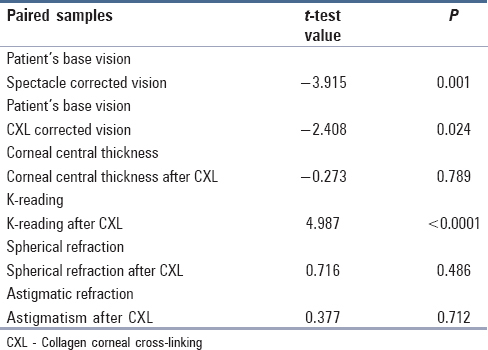 In spite of apparent little improvement between mean of presenting vision (6/30) and CXL vision (6/20) [Table 1] but t-test showed (t = −2.408; P = 0.024) [Table 3], this is a significant improvement in vision. However, this may be of more practical importance as compared to best spectacle-corrected visual acuity in which the mean achieved was 6/18 [Table 1]. Since the spectacle correction needs a high degree of cylinders which will have some drawbacks with binocularity when using same optical lens for distance and near-vision as well as the cylinder distortion and difficulties in manufacturing of such lenses; collagen CXL can be a good alternative treatment of keratoconus instead of lenses. Spectacle correction of refractive error in keratoconic patients would not reduce the burden of visual impairment in this population due to the corneal surface defects which frequently progress and reduce acuity. Thus, even minor structural changes can alter the optical quality. Therefore, the challenge is to select the most suitable type of correction which will provide most comfortable vision. In this study, K-reading shows high degrees of astigmatic errors without significant changes (mean 2.80 ± 1.327 D) preoperative and (mean 3.08 ± 1.717 D) postoperative [Table 1] as well as a weak correlation [Table 2] and [Table 3]. However, in most of the cases, there is irregular astigmatism where the principal meridians are no longer 90° apart and the mires cannot be superimposed clearly. Therefore, after CXL, there is a change in the form of astigmatism and not in the degree. This change was clearly approved by significant K-readings pre- and post-CXL (t = 4.987, P < 0.0001). 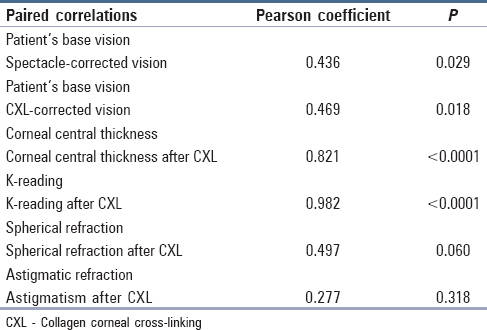 The findings of this report indicate that the contribution of spherical refractive error (noncorneal) is also moderate (mean 2.79 ± 2.09 D preoperative and 2.66 ± 2.10 D postoperative). Therefore, the present results assume that the uncorrected residual refractive error was an additional source which reduced the visual capability in this group. This study has shown that collagen cross-linking appears to be effective in stopping the progression of keratoconus. Although no significant structural changes were noticed statistically from the results, follow-up to 12 months revealed that there was slow and continuous improvement of vision. This improvement could be satisfactory to most of the patients if combined with optical correction of spectacles or contact lenses. 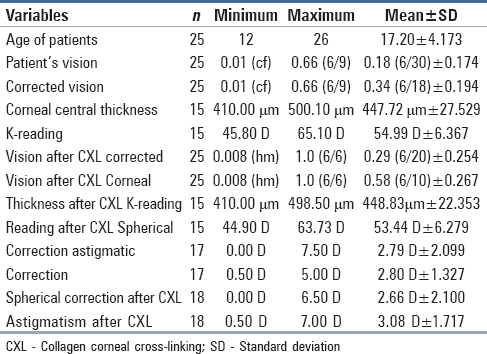 More longitudinal and prospective studies of sufficient sample size including procedures for measuring stability and rigidity of the cornea after CXL are highly required. Higher-order aberrations are also significantly correlated with corneal operations. However, examinations and assessments including prominent aberrations are essentials in eyes with CXL. Kunimoto D, Kanitkar K, Makar M. The Wills Eye Manual. Philadelphia: Lippincott Williams & Wilkins; 2004. Lang G. Ophthalmology a Pocket Textbook Atlas. 2nd ed. Stuttgart New York: Thieme; 2006. Stabuc-Silih M, Strazisar M, Ravnik-Glavac M, Hawlina M, Glavac D. Genetics and clinical characteristics of keratoconus. Acta Dermatovenerol Alp Pannonica Adriat 2010;19:3-10. Mirza UB, Iqbal Y, Haq MI. Visual and keratometric results after corneal collagen cross linking in keratoconus. Pak J Ophthalmol 2012;28:P.115-120. Koppen C. Corneal cross-linking and keratoconus: The change in treatment paradigm of keratoconus. Bull Soc Belge Ophthalmol 2012;321:5, 9-23, 25-7. Wollensak G. Crosslinking treatment of progressive keratoconus: New hope. Curr Opin Ophthalmol 2006;17:356-60. Kanellopoulos AJ. PRK: Present, Past, and Future. Slack Incorporated; 2012. 6900 Grove Road, Thorofare, NJ; United States 8086, Available from: www.slackbooks.com. [Last accessed on: 2017 Sep 10]. Caporossi A, Mazzotta C, Baiocchi S, Caporossi T, Denaro R. Age-related long-term functional results after riboflavin UV a corneal cross-linking. J Ophthalmol 2011;2011:608041. Friedman MD, Pertaub R, Usher D, Sherr E, Kamaev P, Muller D. Advanced corneal cross-linking system with fluorescence dosimetry. J Ophthalmol 2012;2012:303459. Chang CY, Hersh PS. Corneal collagen cross-linking: A review of 1-year outcomes. Eye Contact Lens 2014;40:345-52. Taneri S, Jarade E, Kanellopoulos JA, Muller D. Current concepts and future developments of corneal cross-linking. J Ophthalmol 2015;2015:302983. Hussain B, Saleh GM, Sivaprasad S, Hammond CJ. Changing from Snellen to LogMAR: Debate or delay? Clin Exp Ophthalmol 2006;34:6-8.